When I was a kid, living in New York City and dreaming of my own pony, I lived for Breyer model horses. There were two or three stores that I frequented, my nose literally pressed up against the display cases imaging which horse or pony would be added to my herd. I vividly remember bringing this model of the rearing stallion home. And can see him in all his glory in the center position on my shelf. The purchasing process was lengthy, my allowance saved for many, many weeks. Oh, the anticipation of the prize! This foal was available in many colors but mine was an Appaloosa. Once home, the new horse took the place of honor on my shelf. Then, the horse was carefully introduced to the others in the herd — unknowingly creating protocols that would be used to introduce real horses in future years. Oh, the stories that I created with those horses. They provided hours of entertainment and joy. I wish I still had them know, but when I was in my late teens — and unsentimental — I gve them to a friend’s younger sister, who was also horse crazy. I knew they’d be loved. Although I had never jumped a real horse, this one fueled my desire to make this real one day. 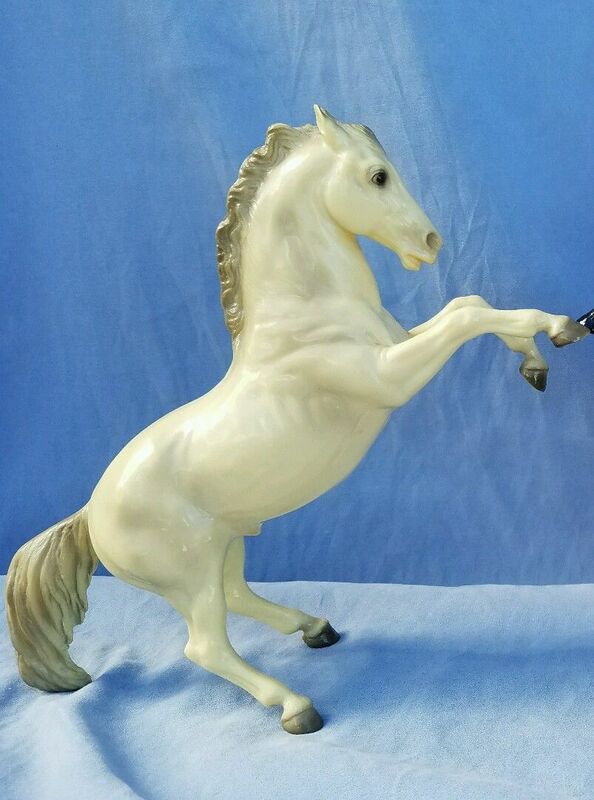 The Breyer Molding Company of Chicago didn’t set out to create the horses that graced the bedrooms of so many horse crazy girls in the ’60s and ’70’s . 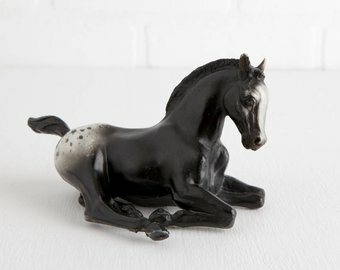 In 1950, the company was contracted to make a mold of a horse with a western saddle for a mantel clock. The clock sold very poorly and the clock company went out of business. 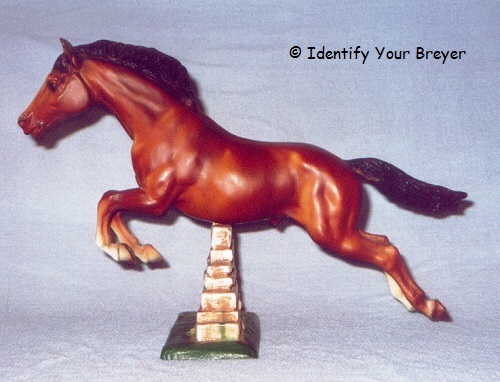 Breyer maintained the copyrights for the mold and that is how history was made. A couple of other little known details of Chris Hess: he himself was not a “horse person”, but he was a great artist. And while he visited some of the horses in person that are depicted in the molds, most often he would sculpt the horse from a picture or drawing. This is no small talent – taking a two dimensional photo or drawing and creating the amazing beauty in the model horses that he did. I dutifully bought Breyer horses for my daughter when she was young, but they never really caught her imagination. Instead, those went on to be loved by the three daughters of Curly’s owner where they’ve sparked a love of real horses. What about you? Did you collect Breyers (or their equivalents)? And what happened to your collection? I had a vast collection of My Little Pony – but they didn’t spark my love of horses. That happened when I was about 18 months old and my Mom took me on vacation to a little village about 2 hours away from home. In this village SHE had learned to ride and her love of horses was sparked in young years. Mom took me to the stable when she wanted to go riding and the 15 year old daughter of the stable owners babysat me. Well, somehow I managed to convince this girl that I wanted to ride too, so she saddled up her horse and took me for a few rounds in the ring, sitting in front of her and (from her explanation) grinning like mad and cooing happily the whole time. Next vacation, I was maybe 3 years old? I convinced my Mom to let me get riding lessons, which at first were lounging lessons, turning into acrobatics and finally “real” riding lessons without anyone else holding onto “MY” horsie. By the age of 5 I was riding on Icelandic ponies regularly (every weekend, 2-3 times) and that apparently sated my need for a horse of my own. I was really really really lucky that my Mom is just about as horse crazy as I am and financed my horse addiction (she also got to ride again, which surely was a bonus for her 😉 ). I tried desperately to get my own daughter hooked on horses. Although she was quite intrigued as a tot, she grew out of it way too soon. There was a pony at my barn that they were allowed to ride one winter and that was fun, but once the pony went back to camp, their interest waned. I always wanted to have my daughter learn to ride well enough to come out with me but neither she nor my son had the passion. That’s so sad, I’m sorry it didn’t stick … I got to spend hours and hours of sweaty, horse-scented quality time with my Mom when I was younger. This only stopped when I was old enough to drive my scooter (16 here in Austria) and she felt she was too old to ride (*gasp* too old??? NEVER). At times my Mom was wishing she hadn’t infected me with horse-itis, we were both a bit obsessed. Sadly I had to stop riding a few years ago when a) it got way too expensive and b) I got too heavy to ride without guilt. Working on it and maybe I’ll get my Mom back on horseback too! My sister has the clock! Too funny that you have the clock! I regret now that I didn’t save my horses but I know they were well loved by the girl I gave them to.. Yes!!! I have a wonderful vintage photo* my Grandfather shot of me, surrounded with some of my treasured Breyer collection. (He had in these horses in “Hospital” for me — drilling a small hole up the broken leg, inserting a metal pin, along with glue, to reinforce the repair. Sharing horses with younger cousins or siblings lead to heartbreaking scratches and damage!) I remember having about 32 horses in total . . . all different breeds, colors, poses.